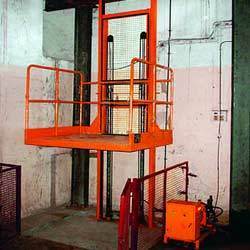 Mast Lifts are suitable to move any type of material from one floor to other floors. They can be made in different capacities ranging from 500 kgs to 1500 kgs. Fixed mast system with hydraulic cylinder ensure smooth lifting & lowering operation. Hydraulic power pack with AC 3 phase motor, control panel pendent stations forms the control function of the lift. Railing & safety door on platform provides safety against loose materials falling. These mast lift are supported with the help of wall or suitable construction at site. We MHE NEXT Engineering Private Limited Manufacturer of Handling Equipment & Storage System. 1. MHE DIVISION: Includes Hand Pallet Truck, High Lift Pallet Truck, Drum Trolley, Drum Palletizer, Shop Floor Crane, Mobile Scissor Lift Table, Hand stacker, Drum stacker, Die Loader, Semi Electric stacker, Electric Stacker, Electric Reach Stacker, Reach Trucks, Tow Trucks, Platform Trucks, Towing Trolley, Dock Leveler, Hydraulic Scissor Lift Table, Mast Lift, Goods Lift, Order Picker (Horizontal & Vertical), Forklifts, Electric Carts, conveyors , metal pallets, plastic pallets, paper pallet, ship sheet , all kind of forklift attachment like paper roll clamp, push pull attachment, telescopic fork, fork shoe , bucket attachment, slip sheet attachment , fork rotator, bale clamp attachment, etc. 2. STORAGE SOLUTION DIVISION : Includes Selective Pallet Racking, Drive-In racking, Mobile Shelving, Push back racking, cantilever racking, mobile racking, compactors, Multi Tier Shelving, Pallet Shuttle racking, Mezzanines. Slotted angle etc. A. Combilift Ltd. & Aisle Master Ltd. Ireland includes 4 way multi directional forklifts, Side Loaders, Straddle Carrier, Specialized equipment for long & awkward loads. Specialized in manufacturing Articulated forklift operates in Min. aisle of 1.6 mtr upto 12650 mm lift height. B. Snorkel Lift, UK Global leader in mnf. aerial work platform. Range of aerial lifts provided safe & efficient working at height s from 4 mtrs to 40 mtrs which includes electric scissor lifts, rough terrain scissor lifts, electric boom lifts, articulating & telescopic boom lifts, trailer mounted boom lifts. C. Cascade Corporation, USA Entire range in forklift attachment like side shifts, paper roll clamp, pushpull, fork rotator, tyre handler, bale clamp etc. Clientele includes: BASF,BLUE STAR ,DHL, ALOK TEXTILE , SIEMENS, FEDEX,ARI-USA , GRINDWELL NORTON ,MAHINDRA AND MAHINDDRA LTD, MAN DIESLE, DAIMLER INDIA, SOLAR EXPOSIVES, FORBES MARSHEL , SCHIFFER & MENEZAZES , LUPIN , CIPLA , CEAT ,ARISTO PHARAM , NBZ, PROFINE INDIA, SANDVIK ASIA ,EMERSON CUMMINS INDIA ,ATLAS COPCO , P &;G, UNICHEM ,MYLON , GLO CHEM , TECHNOVA , FLYJAC LOGISTICS , SK LOGISTICS , NYK LOGISTICS, YUSEN LOGISTICS,FUTURE GROUP, KUENEH+ NAGEL , CCI LOGISTIC, AGRO PACK, BALAJI WAFERS,PUTZMEISTER , GATE WAY DISTRIPARK, CONTINENTAL WAREHOUSING etc.